In our last blog we looked towards the future and how we're incorporating Mid-Century Modern design into our upcoming Wellfleet project. For this blog, we're taking a look back. We've used some staple Mid-Century Modern pieces in past projects that we've seen popping up in other designers projects too! Instagram and other social media platforms have really allowed a new light to shine on Mid-Century design and how it's being reintroduced to modern day interiors. Designed in the late 50's, the Eames chair became one of the most recognizable Mid Century design efforts. We've found fun and chic ways to incorporate it in a few of our projects. 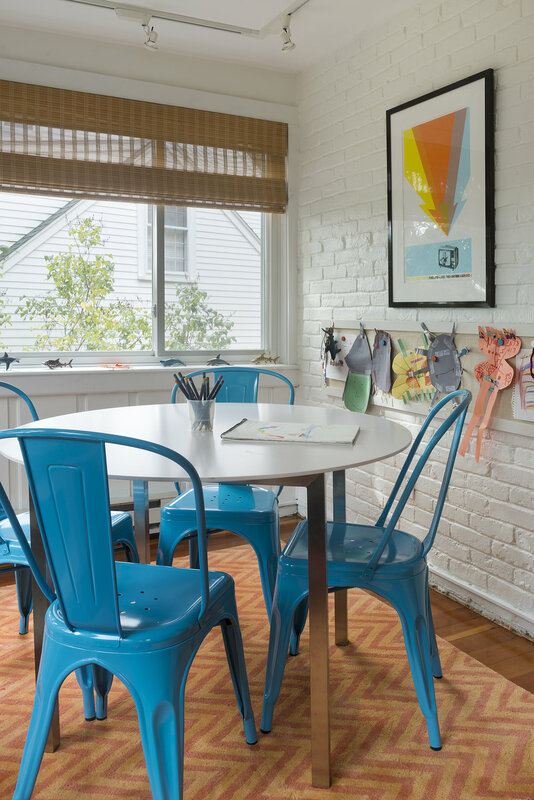 We've collected them below to show off how they shaped a muted and moody in a Fort Point Condo, worked as a mellow neutral accent to a family dining table, and provided a playful blue structure in a kids office. The Eames chairs timelessness has given it a versatility that is exciting to incorporate no matter the room! Sometimes it's just that one key piece that really make a space. In a transition home with lots of clean lines it’s nice to have a piece that provides some shape without over powering whole design. I love to use Mid Century Modern Furniture for that exact reason! It's structural design provides the perfect cornerstone to complete a project. The Nelson Pendant is a lighting fixture that we've used in our Cambridgeport project and a few others. I find that they make a great compliment to almost any of our designs. We’ve used approved reproductions from vendors like Design With In Reach but also from vintage sources like 1stdibs.com - a source that’s not only great for MCM but also your more typical antiques. Take a look at how we've mixed at matched mid century modern lighting and seating in our projects below! Mid Century Modern Deck House on Cape Cod!